3rd floor, 255 Centrum Blvd. 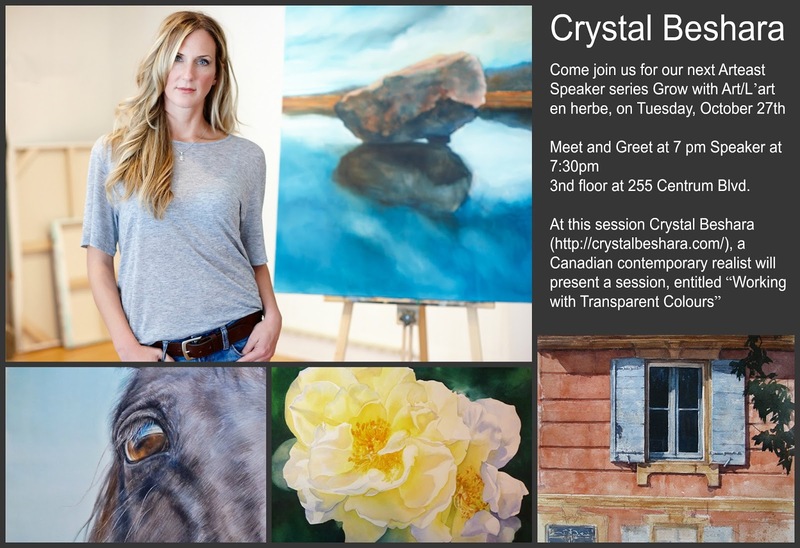 This session, entitled “Working with Transparent Colours” will help artists learn how choosing the right pigment can improve luminosity and glazing in watercolour paintings. Crystal Beshara is a proud two time winner of the prestigious Elizabeth Greenshields Foundation prize. Shortly after graduating with her BFA she became the youngest elected Fellow of The Ottawa Watercolour Society at the age of 23. She has illustrated 4 published children’s books including her original story When I Visit the Farm which was released internationally in 2009. Her work has been featured and reviewed in Canadian House & Home, Modern Family Magazine, The Ottawa Citizen, Ottawa Sun, The Quill & Quire, and Montreal Review of Books. Beshara also is the primary sketch artist for the award winning television series Hard Rock Medical. Coming up in February 2016 is the next Arteast juried show. Arteast members are encouraged to submit their best two and three dimensional work to this annual exhibition. We are looking for insightful, creative, visual art in all media. under Trinity Gallery: Arteast's 'Mosaic-Mosaïque' at the Shenkman Art Centre. Christine Gendron will hold an "Open House" on the week-ends of November: 7-8, 14-15, 21-22, and 28-29 from 10 a.m. to 4 p.m. each day to sell her original (abstract) art as well as her hand-crafted jewellery (company name: Colours Jewellery). As Christine is retiring from her jewellery business, the jewellery is being sold at 50% off the original selling price. There will be one daily draw for a breast cancer bracelet; all persons attending the "Open House" will be eligible to submit one ballot each day. All Arteast members, as well as their family and friends, are invited to the "Open House". Location: 1157 Medoc Court, Orleans. For those who cannot attend on a Saturday or Sunday, Christine will accept appointments during the week. If required, please call her at 613 - 824-4790 to arrange a daytime or evening appointment.